Rivers Inlet Sportsman's Club was established 30 years ago as a resort where fishermen could relax & enjoy the beautiful wilderness setting away from the cares of the world. 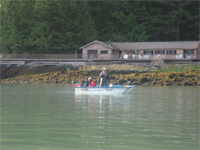 This is the area of the BC coast where trophy salmon up to 80 lbs are caught close to the lodge. There's no need to go far to experience the excitement of a big fish on the line. With cedar lined ensuite accommodations, hearty gourmet meals & exceptional service, an all-inclusive trip to the Sportsman's Club will be a highlight of anyone's life, young or old. At Rivers Inlet Resort, we understand that catching a Trophy Chinook Salmon is the culimination of a life long dream. 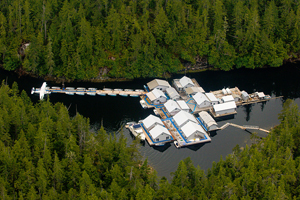 Rivers Inlet Resort is strategically located on one of the most productive areas in all of Rivers Inlet. You can literally catch the largest salmon of your life within a few feet of our dock. Stay with Rivers Inlet Resort and you see that everything we do is geared to help you in your quest to fill your dream of catching a Trophy Salmon.